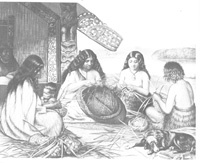 An introduction to flax weaving. Students are given hands-on experience of weaving an article. Incorporates discussion of the cultural beliefs and values associated with the plant and craft.